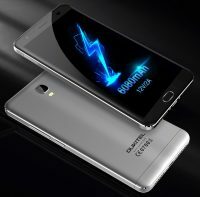 OUKITEL just announced last week that their new model K6000 Plus is coming soon. As a big battery smartphone with Android Nougat OS, K6000 Plus is definitely a device worth waiting. Here we have more information for this flagship device. “The Conquer”, this is how K6000 Plus is defined. We already knew that K6000 Plus will be a fighter in battery capacity and charging speed: fully charge 6080mAh battery in 1 hour and 40 minutes with the 12V/2A flash charger. Here we got to know that K6000 Plus is also fantastic in other aspects. It will feature a 5.5 inch FHD display with AUO brand LCD display and Asahi touch glass. CNC craft on the middle frame make this big battery device looks quite thin. While according to OUKITEL, the thickness and weight of K6000 plus is truly thinner and lighter than K6000 Pro. The camera is another highlight of K6000 plus. The primary 16MP camera is from Omnivision with 16880 sensor, and it adopts PDAF tech for rapid focus. With PDAF tech, it will finish focusing with one calculation and reduce the calculate burden of the processor. The front 8MP camera offers 80° wide angle for group selfies. Both the two cameras are real pixels, no interpolation.